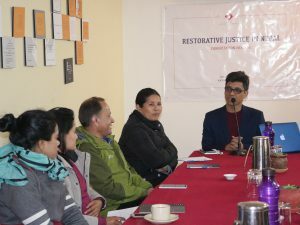 Beginning 2018, Nepal Institute of Justice started a series of national consultation with various agencies and stakeholders working in the fields related to restorative justice. The first of this series was held on January 13, 2018 in Kathmandu. The first episode of the Consultation brought together 21 participants representing various non-government organizations (NGOs). The idea behind the Consultation was to build a common understanding on the need of restorative justice in Nepal’s justice system. The event benefitted a lot from the insights shared by the participants on ways to move restorative justice movement in Nepal. NIJ hopes to carry more of such separate and joint consultation meetings with other agencies working in the field.